British Reparations for Caribbean Slavery: how, why and when? Sir Hilary Beckles, Professor Harry Goulbourne and Ms. Esther Stanford-Xosie participated in what proved to be a stimulating discussion on the Caribbean's claim to reparations from Britain for slavery. The event was moderated by Mr Hal Austin, senior editor with the Financial Times. Beyond Remittances and Tourism: What Future for the Caribbean Economy? Beyond tourism and remittances:what future for the Caribbean economy? 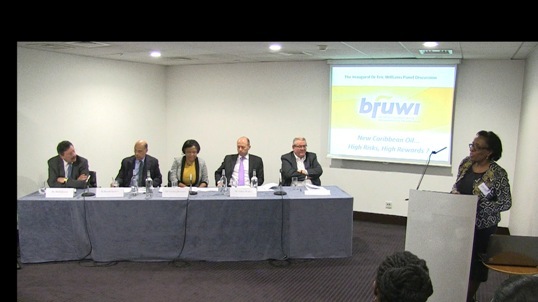 In December 2013, the BFUWI held its second panel debate to discuss the state of the Caribbean economy. The panel included Professor Victor Bulmer-Thomas of UCL, Dr Vindelyn Smith-Hilman and Mr Alan Smith of HSBC and the lively discussion was moderated by BFUWI trustee, Vanessa Rizzoli.